Coming from a Greek dad, I have fallen in love with all the yummy Mediterranean flavors! The flavor combination in this recipe makes for a light, fresh and delicious meal. 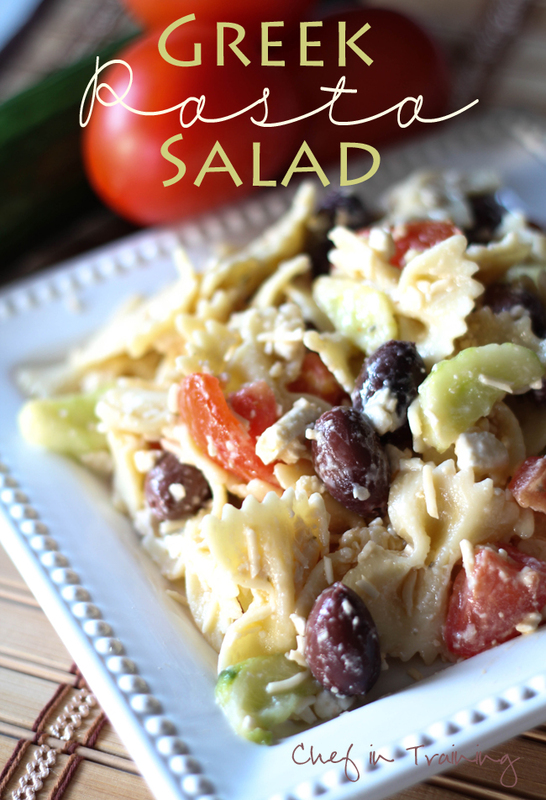 This Greek Pasta Salad is so delicious and so easy to throw together! It can be served warm or cold to fit whatever mood you are in! A fast and delicious meal! This recipe can be served warm or cold and is super flexible to fit your own personal tastes. Cook bow tie pasta as directed on the box. Toss all ingredients together. This salad can be served warm or cold and adding chicken would also be a fabulous idea! Nikki, this looks so good!!! I'm thinking I definitely going to make this for a bridal shower I am throwing this month. Thanks!! Just printed this up! I love these flavors and it looks so creamy and delish! Looks Yummy! Was looking for a salad for my daugher's first birthday and I FOUND it!! Thank you!! I love Greek salad! Mostly because it's an excuse for me to eat Kalamata olives, one of my faves. An easy no-cook side dish; I love it! Looks amazing, cant wait to try it out. By the way what font did you use for the word Pasta in the picture?? Picked up this recipe from Pinterest. Made it and it was delicious! Quick easy with simple ingredients. I just made this with gluten free pasta and it's soooo good! I've got a big bowl in the fridge for quick lunches through the week. how many servings does this make and how much calories are in the servings? Any idea if this would freeze well? Hi! The Italian Dressing link did not work. and I would really love to see it! This looks really good but I was wondering what kind of Italian dressing you used ? I make something very similar with the kalmata olives, sun-dried tomatoes, feta, artichoke, pine nuts and balsamic vinegrette. I get asked for the recipe every time I make it. This pasta salad is absolutely delicious and easy to make. I used rotini and added artichoke hearts. What italian dressing do you use or recommend?